What is it with this Angel guy? 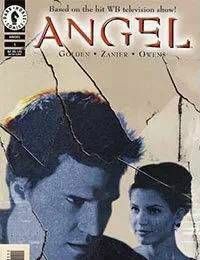 Not only has the moody, square-jawed vampire got his own television show, but now hes getting the monthly comic-book treatment, courtesy of Christopher Golden (Buffy the Vampire Slayer:Angel), Christian Zanier (Buffy #12), and Andy Owens (Buffy #12). Having fled Sunnydale, and all the difficult emotional circumstances that go along with it, Angel has set up shop as a paranormal investigator in Los Angeles. With the help of Sunnydales favorite prom queen, Cordelia Chase, and demon-spawn wiseacre Doyle, Angel has his work cut out for him! Get on the bandwagon now, so that you can say you were buying this dynamite book from the start!